Coach operators in London are having a difficult time with so many obstacles in their path. 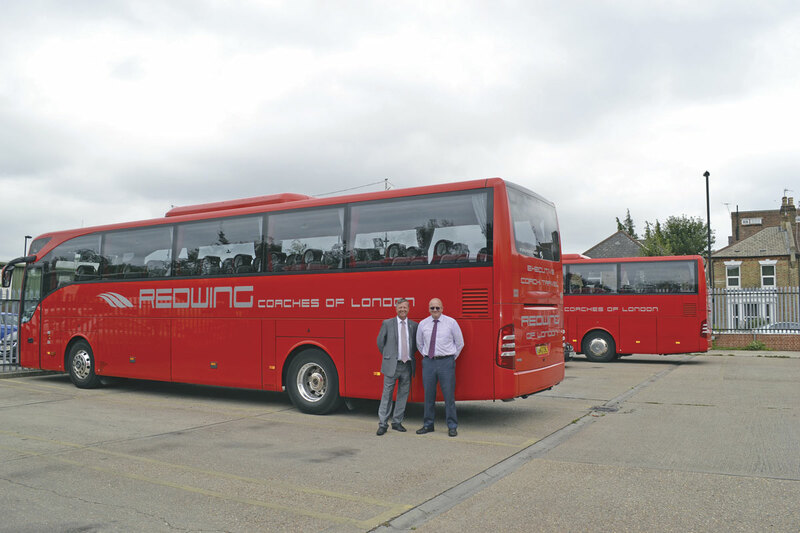 Kirsty caught up with one of the capital’s leading private coach hire businesses, Redwing Coaches, at their Herne Hill headquarters in South London, to find out how they face the day to day challenges. Directors of Redwing Coaches, Nigel Taylor and Paul Hockley. Redwing Coaches was started in 1987 by Paul Campana, formerly of the now defunct Wahl Coaches and was renamed Redwing in the same year. They operated from premises in Coldharbour Lane, steadily building up the company, purchasing the current site in 1999 and becoming fully operational from there in 2000. Paul Campana retired in July 2006 and the company was bought by taxi firm Addison Lee whose aim was to make the company even bigger and better. The current Managing Directors, Paul Hockley and Nigel Taylor were told in 2013 that the company were ‘off loading’ the coaching operation; as Nigel explained, ‘when I heard at the time I kept saying, “I don’t want to be involved in a management buyout.” Paul approached me and said “what about a MBO?” I said yes!’ Five days after they took over the business in April 2013, Addison Lee was sold for £360m. 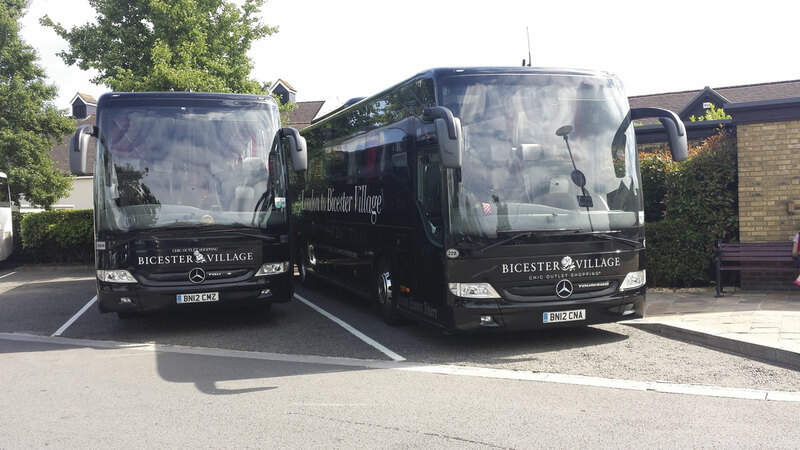 Two of the special liveried Evans Evans London to Bicester Village ‘Shopping Express’ coaches. The daily service picks up at London Victoria and Marble Arch. Nigel had been with the company since 1997 having previously worked for Daisy Bus in Broughton, near Scunthorpe (a service I used to use on Saturdays as a child) and Paul since 2007 as General Manager, coming from his father’s company, Reliance Travel. They took on the business as it existed, reducing the fleet from 59 to 42, and eventually to 38, having sourced a used coach sales specialist to sell a number of minibuses for them. They retained all of the staff, although as you would expect with any businesses, there were natural losses and some drivers remained with the Globus contract that they decided not to continue with. 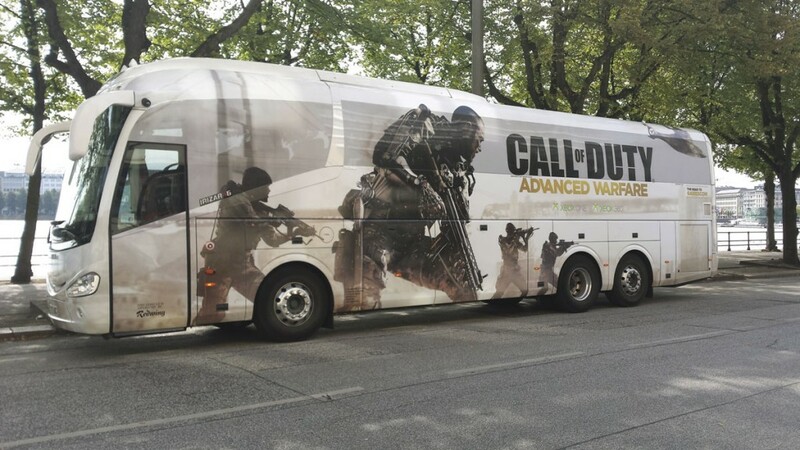 This Scania Irizar i6 was wrapped for a Call of Duty Advanced Warfare competition. In March of this year, Paul and Nigel became the sole owners of Pullmanor Ltd., the holding company for Redwing. 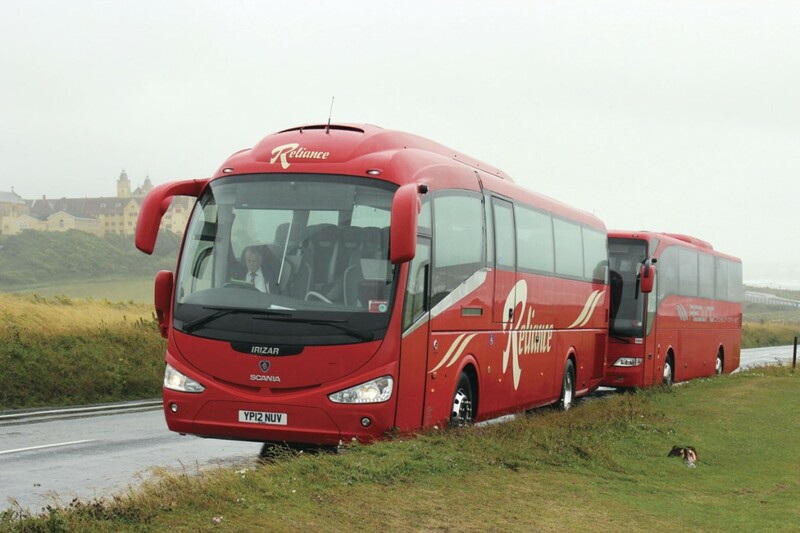 More recently, on 1 June, after many years of close partnership, they acquired Reliance Travel of Gravesend, which now operates as Redwing Coaches of North Kent. They had been essentially running the business on behalf of the Griffin family, who had previously owned Addison Lee, for around eighteen months and Paul’s father, David, who started the company with his father in the 1970s, was still employed as General Manager. All vehicle maintenance is undertaken at the Herne Hill Depot, this coach was in for a windscreen replacement. Reliance’s operation had a natural fit as they offered a lot of infill work with schools which is a key part of Redwing’s business, and despite offering a commuter service, which Redwing doesn’t, Paul is familiar with that type of operation having worked with the company before. The services offered, at the time of going to press, have remained unchanged although it is expected that both will be improved and expanded as part of an ongoing programme. A number of vehicles have already been replaced and two brand new Mercedes-Benz Tourismos joined the fleet of eighteen vehicles. The Reliance livery will be phased out in favour of Redwing’s to offer a continual corporate brand. One of the things that Redwing’s good reputation comes from is their vehicles. They are renowned for having a high specification, modern fleet. 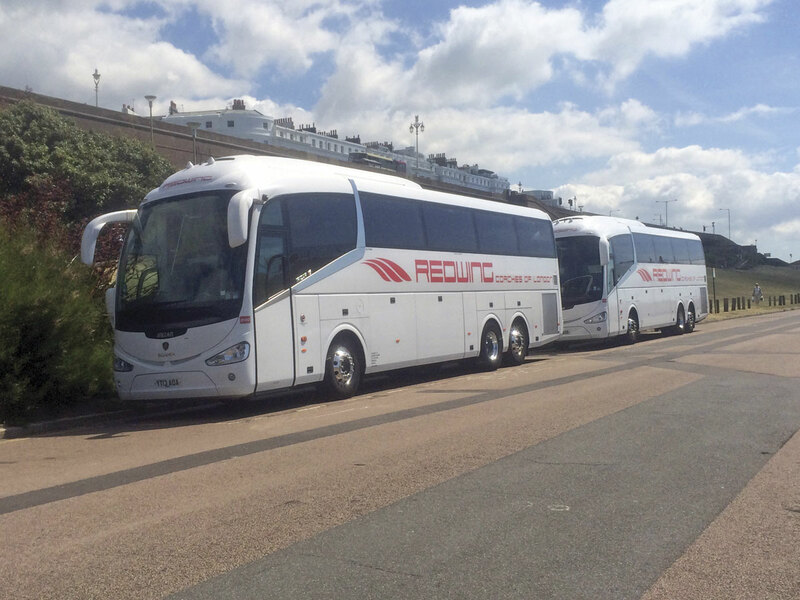 It is currently made up primarily of Mercedes-Benz Tourismo and Scania Irizar i6 standard and executive coaches There are currently 55 in the fleet, mostly Euro5 with ten Euro6s. Two of these were the new Reliance Tourismos with the remainder being used on contract work for Evan Evans. 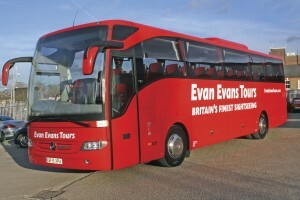 Redwing are the sole coach provider for Evan Evans tours. This Tourismo, the latest edition to their fleet was taken at Leeds Castle. A recent image taken outside Roedean School near Brighton. Financial restraints following the acquisition of Reliance Travel means that the coaches are now on a five-year cycle although Nigel was keen to stress that the finance companies Lombard and Mercedes-Benz Finance had been’ brilliant during the takeover’. Previously, vehicles reaching the grand age of three would be updated, although as Nigel added, ‘they are better built these days so five years isn’t a problem and they are well looked after’. Herne Hill is where all vehicle maintenance, repairs and bodywork take place for the three sites (as well as the Gravesend depot they also have another storage facility at Wandsworth.) They are ATF registered and MOTs are performed in house by VOSA Inspectors and they are very proud of their 100% pass rate. Four vehicles can be housed within the workshop at any one time in addition to one in the paint shop. They also have their own vehicle washer on site and refuelling station. I asked Nigel whether they had hedged on fuel and he advised that they had been fortunate enough not to have fallen foul as some operators did once the fuel prices fell. The livery was updated in 2013 as part of a rebrand and was done in house. The concept was for something cleaner, more modern and practical. They found previously that having a livery spanning across the bottom panels makes upkeep more expensive and time consuming. All vehicles are fitted with a tracking system and CCTV, so in the event of an accident they can immediately see what happened and who was at fault to hopefully avoid any false claims. This is a hugely time consuming but necessary job and Nigel gave a number of examples where the system had confuted injury claims as well as having highlighting driver incompetence, resulting in their immediate dismissal. They have looked at the option of introducing a telematics system which would draw attention to any bad driver behaviour, but they don’t feel that this is something that they will progress with in the immediate future. Great care is taken in the employment selection of drivers and their training is something that they are passionate about. Driver CPC training has always been done in house although Paul explained that they are looking to outsource this and offer ongoing module training. New drivers spend a day learning about the operation and how the yard works before having a couple of hours with the General Manager and some one to one time with Paul. This will often be refreshing them on legal requirements, such as the driver hours. Paul likes to make time for the drivers and as a self confessed ‘morning person’ he is often on site when they arrive for their shifts, giving him the opportunity to converse with them. They currently employ 59 drivers, 42 at Herne Hill and 17 at Gravesend. 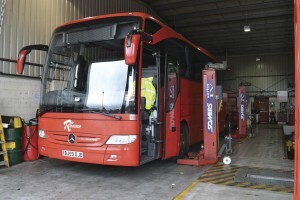 Nigel believes that being surrounded by bus depots is a particular disadvantage, because although there is no shortage of drivers, experience has taught him that the crossover between the two often doesn’t work because they generally don’t seem to have the same people skills and work ethic, although he went on to say that some can adapt. He explained how, on numerous occasions, people haven’t turned up for interviews or even their first day and hadn’t been courteous enough to inform him; additionally, there were those that had turned up for interviews unprepared, wearing casual clothes. The presentation of the driver is as important as the presentation of the vehicle and all drivers are provided with a uniform of a smart grey suit from Brook Taverner, teamed with a crisp white shirt. This was something that Paul introduced. It is this attention to detail that has earned them their reputation and the contracts that they have. 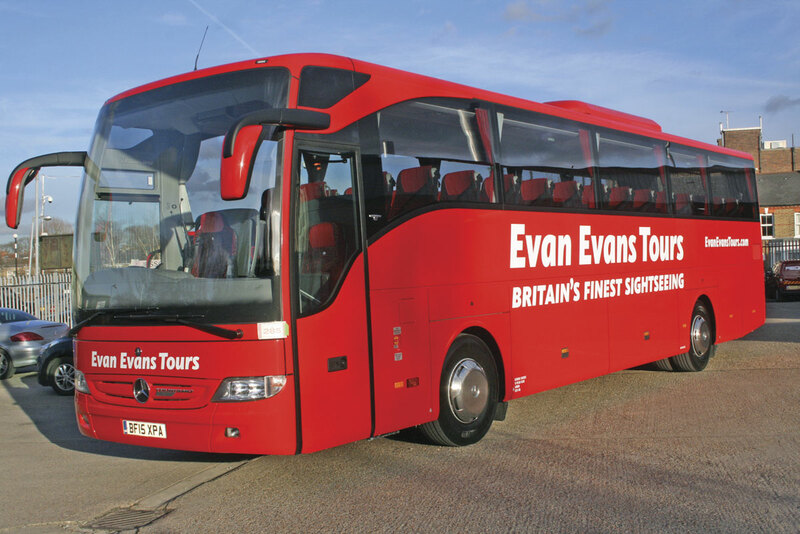 This includes being the sole contractor to one of London’s longest established and largest sightseeing operators, Evan Evans, part of the Trafalgar Group and Redwing’s biggest client. One of several Mercedes-Benz Tourismos in the Redwing fleet, this one was spotted outside London’s prestigious Waldorf Hotel. They no longer operate tours and day trips themselves although they previously ran their own day trips to France under the Consort Campana brand which folded before Nigel and Paul took over. When pressed about the coach tourism industry, Paul commented that it was ‘a very tough industry to be in.’ We spoke about operators pulling out of Europe because they can’t compete with all-inclusive cruise deals but did say that with the recent events in Tunisia and risks to other foreign holidays, people might be more inclined to stay in the UK. Whether that will mean an uptake in coaching holidays remains to be seen. The core of their business is private hire and their ethos is ‘We will go anywhere. We are ready whenever you want, wherever you want.’ Much of their business comes from schools and they work with a number of private and independent education establishments including Queen’s Gate School for Girls, in Kensington and Dulwich College, a day and boarding school for boys. The recent tube strike caused chaos across the city and they had to deal with a number of complaints about late running vehicles despite the fact that they were organised and left site early in anticipation of the queues. A normal 45 minute run to Heathrow took two hours. Fortunately the problems at Calais haven’t affected them. Oh we do like to be beside the seaside! Two Scania Irizar i6 tri-axles at Brighton. A big bone of contention is the Cycle Superhighways, which in Paul’s opinion has ‘stuffed up the whole of London’. He referenced the one on Vauxhall Bridge that cyclists aren’t using but has caused congestion from the narrowed lanes. He feels that encouraging more cyclists in the capital will cause more accidents with bus and coaches as they pedal along the inside of them, completely oblivious to their own visibility. Paul doesn’t feel that there is enough support for coach operators and drivers as he believes associations such as the CPT are more bus orientated. However, both Paul and Nigel were quick to praise their Crisis Control Centre at the time of a major incident that they were involved in. On a day to day basis, the removal of coach parking bays is a real issue. Cameras are issuing automatic fines to drivers during set down and pick up and drivers are constantly worried about getting a parking ticket. The lack of places where drivers can pull up creates problems when they need to take their breaks; they risk breaking the law and being up in front of a Traffic Commissioner. Box junctions are another source of frustration. In somewhere like London, you have to go with the flow of the traffic and assume in good faith that once you enter the junction, that flow will continue. If you erred on the side of caution and stopped every time you approached one of these road markings, there would be gridlock. It just isn’t practical and is yet another fine imposed on someone just trying to do their job. Paul commented on a driver that had essentially ‘worked for free’ one day when he had accumulated a number of fines that about equalled his day’s pay. 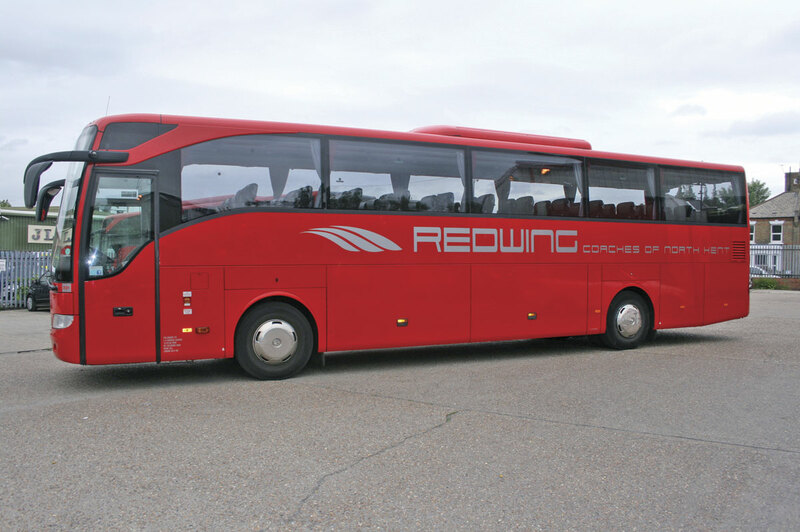 Nigel and Paul have worked very hard to make Redwing Coaches the reputable business it is today and despite the hurdles they constantly have to overcome, they seem to have a solid business that hopefully will remain for many more years.